Artemis Racing announced today that Australian Olympic gold medalist, Nathan Outteridge has joined the Swedish Challenger for the 34th America’s Cup. Outteridge is well known for his results in both skiffs and multihulls, having won the gold in Weymouth in the 49er Class, as well as performing well in the past four America’s Cup World Series events. Outteridge will begin training with the team next week in Alameda in advance of the upcoming America’s Cup World Series in San Francisco where he will helm Artemis Racing – Red. Racing will take place from 3- 7 October, in conjunction with the Bay Area’s best known event, Fleet Week. 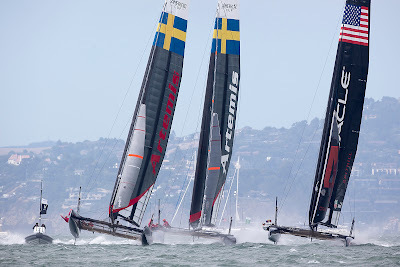 “Joining Artemis Racing is a great opportunity for me. Artemis is a solid team all around and I’m excited to join Terry Hutchinson and the sailing team for my first America’s Cup,” said Outteridge who has just arrived in San Francisco following the Farr 40 Worlds in Chicago. “I think anytime you add a sailor of Nathan’s calibre to a team it’s a good thing. I’m anticipating that the experience we have here, balanced with his youth and enthusiasm, will be a good mix," said Skipper Terry Hutchinson (USA). “It’s great to have Nathan join Artemis. We have seen that his success in skiff and moth sailing have translated well in the AC45 racing. Nathan certainly has a bright future,” added Paul Cayard, CEO of Artemis Racing.